One of the most wonderful days of my life was when I met Paula Deen. She had been writing for our Taste of the South magazine, and I watched her show religiously, but meeting her in person changed my life and the life of our company. Paula was our 2004 Southern Lady of the Year for our magazine, Southern Lady. I knew that people loved her, and from the response we had to her features in our magazines, I just knew that she needed her own magazine. For the past 10 years, we have walked many steps together and have shared so much of our lives. 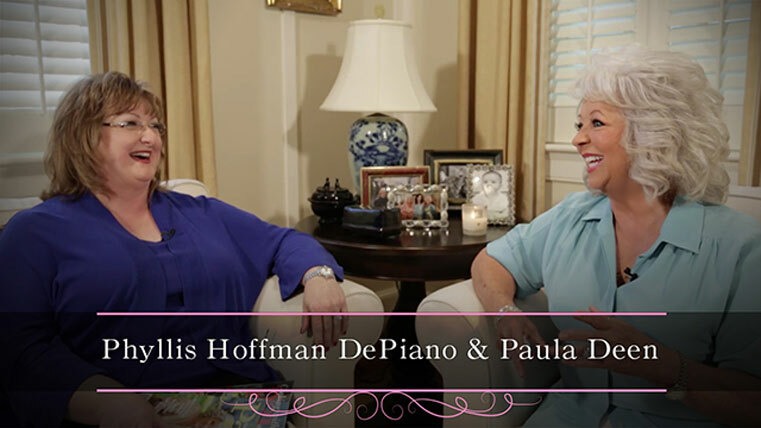 In Savannah last month, Paula and I had a chance to sit down and talk about our 10 year friendship and businesses. I hope you will enjoy our visit with my friend, Paula Deen. Be the first to see part two! Enter below to hear all about what’s next for Paula — her network, the magazine, and her new restaurant. Plus, you’ll automatically be entered to win one of five signed copies of Paula’s Best Dishes. I have always loved Paula Deen!! I want her new cook book as well. It was so nice to see Paula Dean and You. It’s been a while you both look wonderful. Thank You for the wonderful interview. I have so missed you on TV!!! I recorded you all the time cause i didn’t want to miss anything you said and did in the kitchen. Looking forward to the Paula Deen network. CAN’T WAIT….. I always enjoy reading The Ribbon in my Journal! You seem to know exactly what to write and when. And I dearly love Paula Deen. I admire her for pushing through all the adversity she has faced in her lifetime, for being strong and for her love for family. I have missed seeing Paula on tv every day. I can’t wait for the Paula Deen channel. She has been such a great inspiration to many people. I will always love Paula Deen. sweet video! I have that edition you’re holding up and many more! I love everything about this blog!! Puts me in a happy place!!!!! Loved this first video and will surely watch the second one. I love Paula and have one of her books that takes us through her home and about her family and her little ol other house on the property. I would love to be an adopted relative of both of you ladies. I do miss my Southern culture and the downhomeiness and sitting on the front porch or using the porch swing. May you ladies both be blessed. I am anxoius to read your blog. Have so enjoyed your blog. Have always been a Paula fan. So love too both Phyllis and Paula! So enjoyed listening to the two of you…I LUV LUV LUV Paula Dean and her beautiful laugh!! She truly is a SOUTHERN LADY and I cant wait to hear part 2 of your interview with Ms. Paula DEAN!!! Same here. Paula is the best and I am glad she is back! When is Pigeon Ford restaurant opening. Want to visit it when it opens . Great interview! Love Paula Deen! I love Paula! I really miss here on the cooking shows and sure enjoyed this interview! Her laugh always makes me smile! Thank you so much for making me smile. I just love Paula and am thrilled to see, hear or read anything good about her. I have traveled several times just to see her…. snow storm and all. I love this Ribbon in my journal. Looking forward to reading and seeing more. Thanks again. I love Paula Deen and am so proud of her. I don’t have all day to spend on my computer. How do I get out of this thing. Didn’t want the Ribbon in my Journal thhing, thought it was a way to get to the end. All I want is Paula! Paula ~ I love the ‘laughter’ you bring to all of our lives! I have always loved Paula Deen since I graduated high school and started watching her show. She taught me how to cook. When all the negativity started a few years back, I wanted to make it go away for her. So glad she’s making a “comeback” although she never left my heart! I really enjoyed watching this. Just signed up for your blog and can’t wait to start reading it! I enjoy your website”The Ribbon In My Journal”, it is belightful to see Paula Dean. ( Yes we all regrets thing we have said in the past.) God forgave her. I enjoyed Paula Dean Cooking show. I enjoy seeing her sons cooking shows,too. I heard her magazine, have her cookbooks. I also enjoyed her sons cookbooks. Especially she shows the loves of her life, Her FAMILY. .
What can I say but, Love You Paula Deen!!! I love Paula Deen, What else can I say!! Phyllis, you have made my day, again. I loved the interview. I have all the Paula Deen Magazines from the very beginning, as well as all her cookbooks. My son, who is a meteorologist for one of the local stations in Savannah, had the honor of meeting Paula on a show. She was there to promote one of her new cookbooks. He gave it to me for Christmas that year, and when I opened the front cover, I was elated to see she autographed it with a personal greeting. There was also a picture of Paula and my son together. It is now framed and sits on a shelf in my dining room. I cherish it. I also have a Paula Deen bedroom suit. Gorgeous and southern, and I feel lucky to own it. We have seen the world without Paula Deen in it, and it has not been a pretty sight! We are waiting with great anticipation to see Paula’s smile and hear her Southern drawl again! Thank you again, Phyllis, the interview portrayed the definition of true friendship. Such and inspiration of a come-back! Keep up the wonderful work. Good for you Paula ! Hold your head high and show ’em girl ! You are wonderful in my book ! Dear Paula: You are a great inspiration to me and so many of my friends. We love you and pray for you and your family for all the goodness of God to continue to lead you. I see wonderful times and days ahead for you. I am a ‘southener’ and appreciate your demeanor and love of family and food preparation. I cannot wait until the Paula Deen Network launches. I have really missed her shows because they are REAL cooking shows with recipes that we can all cook at home. Hoffman Media is a class act for sticking with a friend. In the world of political correctness we live in today, it was courageous of you to stand by Paula’s side like her legions of fans did. Thank you for that. And..welcome back Paula! We love ya! I am thrilled our dear sweet Paula Deen you are back because truth be known, you never ever left as far as we’re concerned. We ALL LOVE YOU DEARLY!!!! Finally we hear from Paula, and are so glad to. Just want to say that I miss you so and am ready for your comeback. We are all ready! This world would not be the same without you, Enjoyed the interview so much and wish you all the best. If we don’t forgive how can we be forgiven. I also enjoy your family and miss them too. Love your cookbooks and biography. All the best to you. Really enjoyed meeting you in Nashville long ago. Much Love. Love Paula, so glad you are back, you have been missed. Phyllis, thank you for all your beautiful magazines! I am so thrilled you resurrected Victoria, and enjoy every one of your publications! They all encourage and guide us to create beautiful environments, to find joy in living and to recognize opportunities for pleasure and happiness in every day living as well as special occasions. I am so happy you recognize Paula Deens accomplishments and her ability to encourage women to be caring and creative in the food they serve their families, and also to not be afraid to make changes in their personal lives because they don’t know what’s around the corner! She has set many fine examples including how hard work translates into success! ~ I love me some Paula Deen! As a sixth generation family member from Florida, I have always felt Paula to be “family.” Sending abundant blessings for her highest and greatest good! Excited to be connected to your blog. God bless. Paula has always been my idol and I have missed her terribly. God has been right beside her through everything. My dream is to someday before God calls me home to have the privilege of meeting her. My home is filled with all your recipes Paula and I even wear an apron my kids bought me that says cooking with Paula. Cant wait till you are on tv with your own program. MARLENE HENRICKSON , Peoria, AZ. This was just what I needed to start my day Paula, Hope. Things have suddenly been a little rough this pass week for us, but listening to you just now has brought a covering of peace to me. I guess God works in mysteries ways and I am so glad for it. Its time to wake up my loving husband and make our favorite Paula Deens breakfast, real buttermilk pancakes with blueberries and no we don’t forget the butter. Thank you I cant wait for part 2. I believe Paula would say some good has come from what happened to her this past year. I always thought she was a put on. The way she was treated was not right but maybe it caused her to come down to earth and see things about herself she was not seeing. Thank you for this delightful interview with Paula Dean. All good wishes to Paula and her family in their future endeavors! I love both of you.You are true southern women.I still have the very first issue of your magazine.You are both very special to me.Keep up the good work. Love Paula and her outlook on life. Such a strong positive woman. So good to see Paula again! Thank you for interviewing her! I will always think of HOPE when I think of Paula! God bless you! So refreshing to hear Paula’s voice again!! I started watching her show years ago because I loved her cooking, and her laugh and speech pattern sounded exactly like my late mother in law! So glad you stood by a very courageous lady, Ms. DePiano! Love your publications! I so miss u on the cooking channel. I have learned so much from watching u! You are truly a wonderful warm person.I enjoy reading your magazine and all the wonderful recipes. Can’t wait to hear about your new adventures coming your way!! Miss you!! Dear Paula, you my dear have been a huge Inspiration to me. You have put excitement back into the kitchen. I want you to know that it is because of your recipes that are so wonderfully yummy and because of your “Lunch Lady” beginnings I felt that I could also start dreaming my dreams. So I started a cafe’ using your recipes for not only the desserts but breakfast items as well. Thank you for being so true to your self which inspires us but also for giving me the courage to start my own business and Paula I know with your recipes by my side I know I will be just fine. Seven years have past since I first opened, WOW! I sold my first cafe’ and built a new one and I am loving every minute of it. Just so you know how crazy of a girl I am and confident in your recipes, I am the cook, the waitress, and the dishwasher. When you have good food people are willing to wait a few extra minutes. Thank you again for being who you are and for all those wonderful recipes. i opened the email this morning but once I saw what it was I decided to hold it until the end of the day to view because I wanted to have something truly positive to end my working day and Paula Deen is truly it. I love everything she does and feel like she is part of family. BTW we had the pleasure of visiting her restaurant several years ago on a trip through the area and my husband finally understood my passion for Miss Paula. We love you and thank you for being there. Love and miss you dearly Miss Paula. Phyllis thank you sooooo much for doing this interview. When I think of the south I think of Paula Deen and Phyllis Hoffman! Two years ago when we first became an empty nest we literally left dropping our youngest off at college and drove to Savannah:) We planned the trip for a year and thanks to all those wonderful Hoffman Media magazines I subscribe to it sure made for some wonderful memories in the south. Thank you also Phyllis for not giving up on Paula just like so many of her fans didn’t. How does that song go, “I am woman hear me roar…” That’s Paula and I’m delighted to hear that wonderful laugh again. I really miss your show. You showed me how cooking was so much fun and how important it is to cook for family and friends. It’s all about the love and time sharing memories. I can’t wait to see your on line shows. Keep your head up and move forward with more love. I miss the shows ..but I am looking forward to the on line shows to come! Oh, how I miss Paula Deen. I always felt she could be a best friend/neighbor. I do not watch food network anymore since they took her off the show. I feel she got a bad deal, because we all make mistakes. I have dreamed of visiting Savannah just to see if I could meet her. I have all her cookbooks and have a subscription to her magazine. I also have shared the panic attacks, so I totally understand what she has been through. God Bless you Paula and keep up the good works. You are my inspiration !!!! Oh my goodness, I enjoyed this so much. Thank you for giving us a little bit of Paula again. I can remember when my daughter was pregnant with our first grandchild they moved to Washington State. She loved watching Paula with that accent and she would cry, she was so homesick for the south. I love Paula Deen. I even have two sets of her cookware incase I destroy part of a set. I save most of her magazines and have most of her cook books. I hardly ever look at the cooking channel anymore and I am so glad to see her looking well. GREAT INTERVIEW! Looking forward to part 2…. So good to see Paula Deen doing so good!! Felt like I was in the room with you…that is what a gracious hostess does…makes you feel part of what is happening in the home. Loved it. Thank you for all the beauty and fun, the delicious and contagious hospitality you bring in your blog. It was so uplifting to hear Paula’s laugh!! I do miss it so ~ no really watching foodnetwork anymore ~ something has just gone out of it for me. Hoping to see Paula on her own station, that I’ll watch!! Blessings ladies! I love Paula and her boys. I made my first trip to Savannah specifically to take the Paula Deen tour and to eat at Lady and Sons. Neither disappointed!! I’m so glad that we will soon have Internet access to Paula and her new network. Have missed hearing that laugh! A silly fake woman….she is too dramatic!!! Glad people in Savannah don’t really act like that. Oh, but people in Savannah do ACT like that. They have a warm and caring heart just like Paula Deen. They give hope and encouragement just like Paula Deen. Sorry you haven’t seen or met the real Paula Deen. The one who kept her dignity and character in tack during the uncalled for public slaughter. Would any of us have been as repentive. Being judgemental is sinful and mean. I for one, am so proud of Paula for for being truthful instead of trying to cover up what she had said so many years ago. We all have said and done things we regret. The good thing is that we learn from them. I do hope she knows that Matt Laura was not and is not her friend. I find being politically correct is not the same thing as being morally correct as the television shows have shown in not praising Paula for her truthfulness. I miss and love you Paula. Don’t change a thing, not even as much as a hair on your head! I ‘ve watched Paula many times but sometimes I thought she was acting for the camera. Just plain silly . Putting on the dog. That’s why I quit watching her. I have loved your magazines (and now your wonderful newsletter) for years. I am so happy to hear Paula’s laugh on this video. Good for you, ladies! Paula, you have been such an inspiration to me. Your story of your life before you became famous is wonderful in itself. Your kindness shows thru to all that admire you. Your handling tough times recently, like a true lady has taught us all a lot, and I think you for that. Now do an unlady like thing, and thumb your nose, silently to all who scorned you. We love you and glad your back. Good luck on the new project. Come to Portland Oregon sometime, please! Paula Deen and her family are good people. They represent home and comfort and love to me and so many others that are fans. I question why Paula was targeted for something she said so very long ago, possibly taken out of context while so many other celebs out there trash talk all the time and don’t get called on the carpet. We all make mistakes in life but not all of us try to rectify those mistakes. Paula has done a lot of good out there and I feel that she and her family can stand as examples to the rest of us on how to treat our neighbor. Thanks, Paula, for the peace that you instill in me when I watch your or read your magazine or use your cookbooks. Loved watching all of your shows and I feel like I hardly missed a one! Enjoyed your boys too but no one measures up to your enthusiasm and talent when cooking. I know for sure when you are back on TV you will have a huge audience that have all been waiting for you to return!! Paula, I’ve miss you so much. I saw all your shows and have all your recipes. Paula, I know I’m just one of many fans, but you feel like my best friend! I’ve been to Lady and Sons, but didn’t get to meet you but took my pic with your paperdoll! And signed a book they had for you for Christmas. You are such an inspiration to many of us and we adore you. I was coming to see you in Nashville but I’m having surgery soon and afraid I won’t be up to it. My daughter offered to take me for my birthday! Maybe you will be back this way soon. Blessings, Lady, to you and yours. I have saved every one of Paula Deen Magazine since its premiere issue. I have learned so much from Paula on cooking. Thanks for the special interview!! Paula I’m so glad to see that you are back, but I had no doubt that it would happen. You’ve got a lot of wonderful people behind you and your family… good luck from the bottom of my heart.. I have saved every one of Paula Deen Magazine since its premiere issue. When the Jan/Feb issue arrives in my mailbox, I take out all my previous Jan/Feb issues and look for all the wonderful seasonal recipes in those past months, and I do this through the year. I have no reason to turn to The Food Network. I hope the powers that be realize they made a huge mistake in dumping Paula. Paula, I’m so glad you’re coming back….I miss your fantastic show and great recipes. I saw your show in New York and gave a hand crochet shawl to the girl to give to you. I sure hope you got it. Thank you so much for this interview. I have missed seeing Paula everyday — I watched every episode no matter if I had seen it before or not. I, too, have tried many, many of Paula’s recipes and my family just loves them. I met Paula in Austin when she did a book signing. I bought all of her cookbooks and she and that adorable Michael autographed every one of them. I even bought the cookbook for kids and although we were told they wouldn’t personalize the book, after I told Paula and Michael that my grandson (who I bought the book for) was high functioning autistic, they both personalized the book. What a pair! The food channel has never been the same since Paula left — what a rotten deal she got! People need to remember that we all live in a glass house and what comes around goes around. I tell everybody that when I grow up I want to be just like Paula (LOL – we are the same age). I also miss the boys and their cooking shows (not sure what happened there). Get Paula back on TV and the sooner the better!!! I agree with you completely! Everyone wonders what happened with her sons!?!? What a heartwarming interview! I love Paula Deen’s recipes, and I only prepare The Lady’s Perfect Scrambled Eggs for my family. I can’t wait to see the next interview with her! I love Paula’s magazine, I have a box full of them just can’t seem to throw them away. ( I refer to them when I’m having a party for new recipes). Paula I have to say your restaurant in Savanna will always be a part of my fond memories with my dear husband of 40 years. Two years ago we stopped in for lunch while on Vacation ( we live in Michigan) I was so excited that I actually got a table for us. The food was wonderful, we had the salad and sandwich combo. The plate was so pretty I hated to eat it and mess it up. Last year I lost my dear husband to cancer. I miss him terribly, buy the memories of us walking around beautiful Savanna and eating at your restaurant will always be on my mind..
Paula….I met you in Buffalo, NY when you did a show at Shea’s Theater. I told you then what an inspiration you were to me (and you still are!! ), and I also mentioned that I had tried 240 of your recipes, Your response, “Well, I hope at least 239 of them were good!”. We had a good laugh. Just wanted to let you know that I’m up to recipe 288 and still plan on trying more & more of them. God Bless You and your Family, Always. Much Love & Prayers to You. Looking forward to seeing you again in Birmingham Al. again. I loved the interview you and Paula, you both are great. I try to get all od Paula’s cook books and as long as I can get them, I will. Paula I just want to say, you are the best. There is only one other woman that can cook as good as you, and that is my cousin Debbie there in Savannah, so I guess that the best cooks are there in Savannah, Ga.
magazine and the recipes are the greatest. First of all I am a guy (didn’t see any men on the comments) and my wife and myself have loved you for a long time. We live in Montana and have been to the Lady And Sons 4 times to meet you but never have so far. We love everything you do and stand for. You go girl, we will be behind you all the way. I have always been a big fan of Paula Deen’s. I met her at a book signing but, I never got to actually speak to her. People make mistakes in life all the time and I feel that she really got a sore deal from it. I think she has more than paid for her mistakes. I am more than happy to welcome her back. She’s a wonderful lady! Some people just wear me out. If they would just examine themselves instead of being so fast to point a finger, this world would be a better place. The Bible says,he without sin cast the first stone. I met Paula Deen back when she was in the first little restaurant in Savanna. She and Bobby talked with us very patiently and also had my picture taken with her. I take her magazine, have mostly all her cookbooks. From what I can see she is human like [ ALL] the rest of us. YOU GO GIRL! Hi Phyllis. I just signed up yesterday to start receiving your blog by email. I am delighted that the first blog I received today is an interview with the lovely Paula Deen. I love her! I personally feel like she was given a HUGE bum rap in the media. It all seemed like a ploy to create a scandal to sell more media goods. She comes across to me like a genuine, likeable person, one whom I’d love know as a friend if we were neighbors on the same street sort of thing! I did happen to run into her on a Caribbean cruise I took last January and had the wonderful chance to exchange hellos with her. She was very friendly and gracious. By the way, please tell her she also looks terrific! Oh, and tell her I appreciate her ability to keep on going in the face of adversity. I hope the recent hard times will only show those who tried to hurt her that she is a strong woman and will only bounce back stronger than ever. You ROCK, Paula!!! God bless!!! And thanks, Phyllis, for the interview. I look forward to the next installment! I love my Paula Deen magazines! Thank you for talking her into the magazine! My own Mom gone by the time I was 9, I learned to cook from my Mother-in-law. And have never stopped. This reminds me of home. The family table. To gather. Lovely chat and todays inspiration. Looking forward to the newsletter soon! I so much enjoyed this interview and am so grateful to Phyllis, one of the most charming ladies I’ve ever met, for bringing it to us. I am so glad all the hullabaloo is behind us and we can enjoy Paula and all her wit and personality once more! Though I was disappointed with some past actions of Paula. Most of us have done something to disappoint another. The degree may vary, but we’re all human. I met Paula at a food show in Philadelphia and found her to be fun and entertaining. Her life and the decisions she’s made are not for me to judge. I enjoyed her cooking shows for years and miss them. I learned to cook from Paula, butter and all!!! I enjoyed this video, love her furniture collection and have nothing but fond memories of watching her. I remember the first time I watched Paula on Food Network and thought…what a delightful, down-to-earth person. I honestly have to say, as the years past the Paula I had grown to enjoy so much disappeared slowly. I found her simple delivery of giving us wonderful recipes and transporting us into her country lifestyle substituted with constant cackling and craziness. I truly missed the sweet, straight-forward and genuine Paula. I continue to admire Paula and her amazing story. I wish the best for her. Thank you Paula for all your hard work. You are appreciated. This is wonderful – two lovely Southern Women who are keeping “southerness” alive. I keep waiting for you to have your own network on TV. There are many southern women like you that I’m sure would love to join you on it. Loved the interview with the two of you. I can see why ya’ll are such good friends. Two peas in a pod. Love you Paula, just want to see more of you. I love Paula Deen! Thank you for the interview! I had a good laugh! Love Cooking With Paula Deen and Southern Lady magazines—how ironic that Phyllis and Paula met in Destin, where I live. Paula, I have enjoyed you for years, my family and friends think we are so much alike which is a honor for me. I miss seeing your cooking show but read your magazine every month, sometimes more than once. Good luck to you and I hope to see more of you. Just yesterday I was watching The Food Network and missing Paula Deen. That is not to take anything away from the wonderful hosts I was watching, but just still missing Paula and her infectious laugh, smile and yummy food. I searched for what she is doing now and found all of the wonderful things that I am sure you will reveal in Part Two of the interview. I love everything both of you ladies do. You are an inspiration to so many women. Very fun post! Paula Deen a bigot! HA! I saw her in person and she definitely was not a bigot. She brought a young Africa American up front and was as nice as could be to the person. Let’s move on now and let it go. I Love Paula and love that she is on a comeack.She has made her mistakes but you know that’s what humans do.Paula has worked her fingers to the bone and made a life for herself and family unlike alot of people in america who are just laying around popping pain pills and waiting for a hand out. Loved the interview and Love both of you! You are both what a True Southern Lady should be! May God continue to Bless each of you! I met Paula Deen, Bobby Deen, & Bobby’s wife Claudia @ the Dallas Metro Cooking Show. I found them to be charming & very nice. Paula has helped many people & just like the rest of us she has made some mistakes. She apologized & moved foward. She is doing what she does best, cooking & sharing her love of food with the world. Let’s enjoy what Paula has to share with us- her best dishes! Love you Paula & you too Phyllis! For those of you who continue to crucify Paula for actually admitting to using a racial slur … and apologizing … Check your own verbal history. Black, white, pink or blue, most people have uttered some word(s) of racial bias in their lifetime … No skin color is exempt from that bias. There is one word for Paula Deen after all she has been through and I am not the first to say it….LADY. Yes, Paula Dean is a Southern Lady!!! She is like a grandmother I wish I had!! Love her & what she stands for!!! What a fun interview! I’m sure laughter abounds when the two of you are together! Thanks for all you do! What a joy it was to hear both you Phyllis and you Paula and your stories! Great interview. Can’t wait to see part #2. I hope some day to meet Paula . we love her here and her cook books, and magazines. I too would love to meet Paula. I miss her show – I never missed it. I enjoy her magazine. I read it cover to cover. I have made a lot of her recipes from her cookbooks. Good Luck to you Paula in all you do. We love you Paula Deen!!! We wish you all the best! Your true fans will always stand behind you. Fun interview! Love you both. I always look forward to receiving both of your magazines. I agree with you Dianne. Paula Deen has shown the world her true colors and she is a disappointment. I have met Paula Deen several times and you are wrong in the impression you have of her. She’s a kind hearted woman and genuine as they come. If you believe everything the media has to say, then you are the bigot and have no mind of your own. I am very disappointed to see you have interviewed Paula Deen. She is a bigot and dishonest in the portrayal of who she is. She should not be given any kind of platform. Everyone has done or said something in their life they later regretted. Paula has done more to make up for early mistakes than most people. Real Christians would forgive and go on with their lives. Love, love, love this kind, hearted woman. Everyone has made mistakes and mis-spoken. Get over it. We need more Paula Deen’s in this world! I appreciate you both so much. Two of my very favorite people. Love the many magazines of Hoffman Media, I have Paula’s 1st issue saved as a keepsake. Love to re-read back issues. Thank you both. Enough of the foul mouth … Paula Deen. what you talking abou, make your self clear. I love both of you!!! What a fun interview!!! Paula has long been one of the people I admire most in this world…her genuine warmth and love for people, her inspiring spirit, her contagious southern charm! I was inspired by her book, inspired when I met her in front of her restaurant in Savannah, spending hours talking to the crowds, inspired by her “come back” story, and her love of family and friends. She is just the epitome of a true strong southern woman….I would SO love to be a neighbor and friend, and really know this woman! But since I can’t, I thank you for bringing a bit of her beauty and grace to us all. Your blog is wonderful and so is Paula Deen. She always brings a smile to my heart. Oh my gosh Phyllis, I hear your mother’s voice when you talk! I hear you too, but you are your mother’s daughter! And that’s a good thing. I love your blog. When I come home from working in a prison all day, your blog fixes everything! It is uplifting after seeing so much heartache all day. All the pictures are beautiful. And, I love Paula Deen and just ordered her cookware in yellow.